President Joko Widodo has warned protesters planning to stage a massive demonstration in Jakarta later this week to refrain from violence. He issued the warning yesterday after police raised the city's security alert level to its highest, ahead of Friday's mass march by Muslim hardliners against Governor Basuki Tjahaja Purnama. 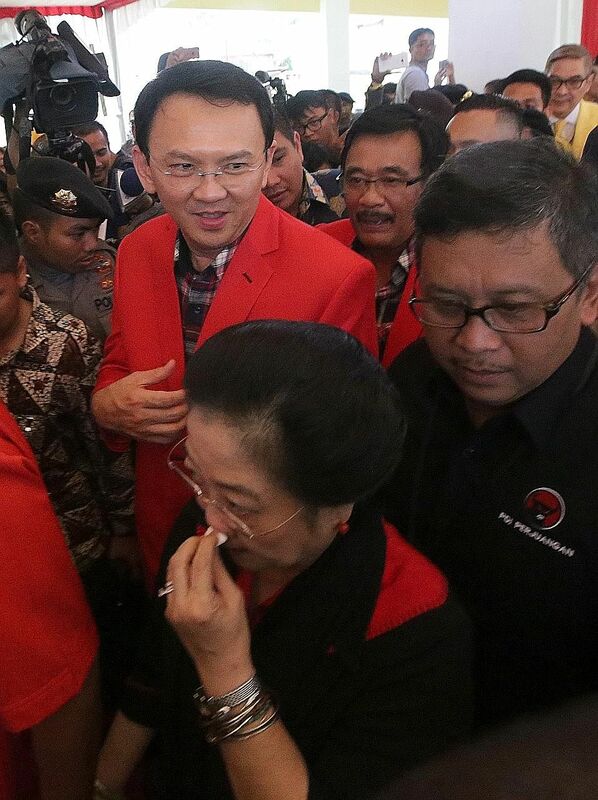 Mr Basuki, or Ahok, as he prefers to be called, is ethnic Chinese and a Christian. This will be the second protest in Jakarta against him in as many months, prompting observers to caution that issues of race and religion could turn his re-election campaign into a test of religious tolerance in Indonesia. The metropolitan police have mobilised about 7,000 officers to secure the city and to prevent any outbreak of violence during the election campaign, which began last Friday. The police will be reinforced by an additional 500 soldiers from the Indonesian armed forces. National police chief Tito Karnavian said the security level was raised as thousands are expected to arrive from outside the city to join Muslims in Jakarta to protest against Ahok for allegedly insulting Islam. Mr Joko, who is popularly known as Jokowi, said in a statement that while public demonstrations are a democratic right of all citizens, those rights do not include allowing them to impose their will and damage public property. His government will guarantee Indonesians' right to free speech but it will prioritise public order and it will not tolerate any violence from protesters. "I have prepared our security forces and they are ready to perform their duties in a professional manner if anyone commits anarchy," the President said. When Mr Joko was Jakarta governor, Ahok was his deputy. Ahok is expected to be re-elected but his race and religion have made him a target of critics who say he is not suited to lead the capital of the world's most populous Muslim-majority nation. The first protest on Oct 14 was triggered by his criticism of opponents who had cited a Quran verse to attack him. He has since apologised and subjected himself to police questioning over the incident. But that did not stop an estimated 10,000 Muslim hardliners from staging a mass protest outside City Hall two weeks ago. A handful of Islamic groups in and outside Jakarta has called for Muslims to rally behind protesters in the capital, reported The Jakarta Post yesterday. They include the Islam Defenders Front, whose chairman Habib Rizieq Shihab has urged all Muslims to take part. However, there are those such as Indonesia's largest Islamic group, Nahdlatul Ulama, which has discouraged members from taking part and prohibited the use of its symbols at the upcoming rally. Still, the authorities are anticipating that more people will show up on Friday, including many from places like Bekasi or Tangerang. The protest, to take place after Friday prayers, is being held in the same week that Jakarta is hosting international delegates attending the World Peace Forum and the Indo Defence 2016 trade event. Tensions remain high, with the police yesterday having to address rumours that its officers have orders to shoot on sight. "There is no such order," said police spokesman Awi Sutiyono, adding that officers are prohibited from carrying firearms during a protest. Meanwhile, Ahok was in South Jakarta yesterday on a blusukan, or impromptu visit, to a local community, which was a trademark of Mr Joko when he was the city's governor. Ahok did not comment on the upcoming protest and stopped only to address the issues of flooding faced by residents in the estate.